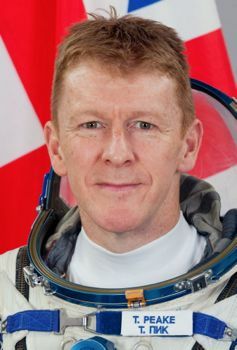 British pilot mission specialist astronaut, 2009-on. Status: Active 2009-on. Born: 1972-04-07. Spaceflights: 1 . Total time in space: 185.92 days. Birth Place: Chichester. Family: Astronaut. Country: UK. Flights: Soyuz TMA-19M. Bibliography: 5877. 1972 April 7 - . Birth of Timothy Nagel Peake - . Nation: UK. Related Persons: Peake. British pilot mission specialist astronaut, 2009-on. 1 spaceflight, 185.9 days in space. Flew to orbit on Soyuz TMA-19M (2015)..
2015 December 15 - . 11:03 GMT - . Launch Site: Baikonur. Launch Complex: Baikonur LC1. LV Family: R-7. Launch Vehicle: Soyuz-FG. Soyuz TMA-19M - . Call Sign: Agat. Crew: Malenchenko, Kopra, Peake. Backup Crew: Ivanishin, Onishi, Rubins. Return Crew: Malenchenko, Kopra, Peake. Nation: Russia. Program: ISS. Class: Manned. Type: Manned spacecraft. Flight: Soyuz TMA-19M. Spacecraft Bus: Soyuz. Spacecraft: Soyuz TMA. Duration: 185.92 days. Decay Date: 2016-06-18 09:15:00 . USAF Sat Cat: 41124 . COSPAR: 2015-076A. Apogee: 418 km (259 mi). Perigee: 404 km (251 mi). Inclination: 51.60 deg. Docked with ISS. On Jun 18 Expedition 47 crew members Yuriy Malenchenko, Tim Kopra and Tim Peake transferred from the Rassvet module to Soyuz TMA-19, closing hatches at 0235 UTC and undocking at 0552 UTC. Soyuz TMA-19M made its deorbit burn at 0822 UTC and reentered for a safe landing in Kazakhstan at 0915 UTC. 2016 January 15 - . EVA ISS US EVA-35 - . Crew: Kopra, Peake. EVA Duration: 0.20 days. Nation: USA. Program: ISS. Astronauts Kopra and Peake made a spacewalk from the Quest airlock in EMU suits 3011 and 3008. They replaced the Sequential Shunt Unit (SSU) electronics box at the base of the 1B solar array on the S6 truss segment. The replacement SSU was launched on STS-96 in 1999 and had been stored since then inside Unity and then PMA-3 until being unpacked in December for the spacewalk. The old SSU failed on Nov 13, shutting down power to the 1B solar array (one of eight on ISS). Full power was now restored. The astronauts also continued cabling work for the IDA docking adapter and relocated a vent on the Tranquility module. The spacewalk was cut short when Kopra's suit developed a small water leak which accumulated in his helmet; this was the same suit that had a more serious leak during Luca Parmitano's spacewalk in Jul 2013. Kopra and Peake depressurized Quest at about 1243 UTC and ventured outside at 1300 UTC, returning with hatch closure at 1727 UTC and repressurization at 1731 UTC. Peake, who was a European Space Agency astronaut sponsored by the UK, made the first UK-flagged spacewalk, and the first spacewalk by a British citizen who was not also a dual-nationality US citizen.